Poker Kaki Forum • View topic - LWPS V (22nd & 23rd Jan) - Early Bird Promos! LWPS V (22nd & 23rd Jan) - Early Bird Promos! Re: LWPS V (22nd & 23rd Jan) - Early Bird Promos! SunScreen wrote: At which level does the rebuy for the main event stops? What is the starting chip for the main event? How much chips will u have when you rebuy? The rebuy period will conclude at the end of level 4(2hours). 4k starting stacks, 4k chips for a rebuy. the freeroll is at 12 and ME at 2pm so im assuming the freeroll is only 2hrs max? also wht is the expected duration of the main event? is it possible to catch a morning ferry and after playing, catch the last ferry back? or is it a must to book a cabin? It's not a must, but it's better to because you won't know how far you'll go in the main. Plus, plenty of side events and games to keep everyone busy. The 10am ferry should be fine. Having said that, it does really depend on the amount of entrants, which is something we cannot predict. If it helps, we had roughly 60 players for last month's freeroll. ok thanks loads! so if i wanna register for the freeroll i just leave my name here and get my tickets with NC? Yes. Do note however, that actual registration takes place on board. Leaving your name in this thread helps us to budget logistically for rough field sizes. Placing your name here does not guarantee you a freeroll slot. ikelos wrote: Yes. Do note however, that actual registration takes place on board. Leaving your name in this thread helps us to budget logistically for rough field sizes. Placing your name here does not guarantee you a freeroll slot. only 2 more days left before the early bird promo ends ladies and gents! * - 1-for-1 on all cabin bookings. Book a cabin and your second night is free! * - All early bird bookings will be eligible for a lucky dip on board. 2 lucky winners will receive a FREE Junior/Deluxe Suite upgrade! * - All ladies who play the Main Event get a FREE cabin for 1 night! * - 1 day extension charge waivers for all Main Event players! Ring up those friendly folks at the NCTours hotline 6214 2822, and reserve your cabin and ferry ticket now! Any bros also coming going to the tournament alone and wants to share a cabin? Coz I will be going alone so need to find a roommate.. Do let me know k, if nt have to find a single cabin or some other ways already.. Haha.. Maybe can sleep on the poker table in the nite, will have more luck in the day haha.. Booked my ferry tix already! See you all then!! I have a some questions that i need to know before i go for it to book the ferry, pls help. can I to know the blind structure for main event, how many minutes blind? how is the structure? is that Turbo like the last rebuy event in LWPS 4? newmay wrote: I have a some questions that i need to know before i go for it to book the ferry, pls help. All side events will have 20 minute blind levels, while our main event will have 30 minute blind levels as usual. early bird promo ends at 7pm today ladies and gents! call NCTours at 6214 2822 to get your ferry tickets and cabins if you haven't done so. the 1 rebuy and 1 add-on in the main event cost $130 or $100? 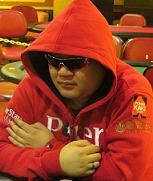 cianopher wrote: the 1 rebuy and 1 add-on in the main event cost $130 or $100?